Forward Isabel Huntington may not take to the field until round five of the NAB AFLW season, still suffering the effects of a sprain to her reconstructed right knee. 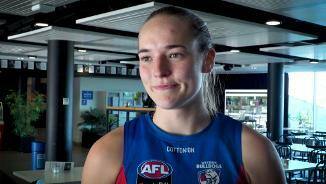 Emma Kearney has hailed new Western Bulldogs teammate Isabel Huntington's sudden impact at the Kennel. 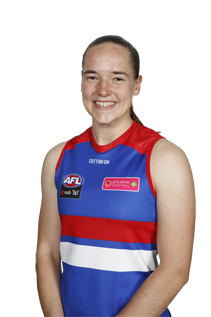 Recruited to the Club as the overall number one draft pick at the 2017 NAB AFLW Draft, Huntington looks to become a key member of the Dogs’ forward line. Recognised for her impressive goal kicking skills and ability to move into the midfield, Huntington has proved to be an incredibly versatile player during her time at the Sandringham Dragons and Melbourne University. Huntington impressed in the 2016 AFL youth girls’ national championships where she gained more than 30 possessions and booted five goals in one game.